Steamboy (Revere MA US) on 2018-01-22 11:02:31. This 2 and a half hour pentrex dvd from 2015 features lots of nonstop action in the southwest state. There are many appearances of mainline freights on BNSF in the north, and Union Pacific on the sunset route. There is a second visit to the private electric coal railway that was first shown in last year�s rail explorations dvd, amtrak�s Southwest chief and sunset limited, small short lines, and 2 tourist attractions from f units on the verde canyon railway, to steam on the Grand Canyon railway with Chicago Burlington and Quincy 4960 and lease Amtrak F40PHI�s. 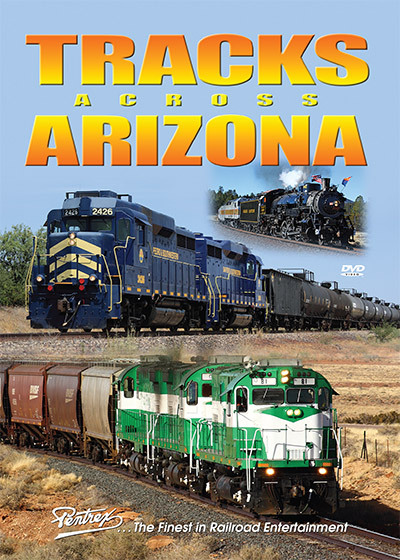 If you love railroading in the southwest, this is a great companion and additional add-on to the rail explorations dvd. Pentrex Fan (Antarctica) on 2018-04-05 20:51:41. All I have to say is that this video is embarrassingly bad. Please stick to digitizing old material before producing any of this new garbage, please. subscriptions@macleodweb.net (Etna ME US) on 2018-03-31 09:02:08.
its ok, worth the money but does show how pentrex has slid in quality over last 5+ years. sad as they used to be the litmus test. still some enjoyable info and I don't regret buying.